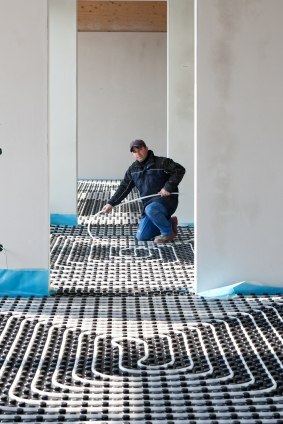 Looking for Radiant Heating in Carthage, Missouri? Carthage residents and businesses need reliable, affordable heating systems. Building on our years of experience one project at a time, Barone's Heat & Air, LLC works hard to offer dependable radiant heating in Carthage, Missouri, creating comfortable spaces across the region. Barone's Heat & Air, LLC provides Carthage clients with qualified professionals, fully trained in the latest radiant heating system designs. We’ve been working in your neighborhood since 2009 and will happily provide a list of local references to any potential customers. Trust your heating system to the pros at Barone's Heat & Air, LLC, specializing in Carthage HVAC installation and repairs. Radiant heating should be customized to your living space or work area, designed to cover all key areas for efficiency. Barone's Heat & Air, LLC knows the local Carthage climate and custom designs radiant heating systems for properties around Missouri. Give us your distinct needs, property layout and budget and Barone's Heat & Air, LLC will provide design and installation of the ideal system, including open or closed radiant heating, as well as single- and dual-zone designs. Carthage clients appreciate the support and assurance of our Barone's Heat & Air, LLC guarantee, offering peace of mind throughout the long Carthage, Missouri heating season. Barone's Heat & Air, LLC provides professional service from initial contact through to project completion and annual maintenance. Protect your family’s comfort level and budget, despite what the Carthage weather throws at us, with a radiant heating system from Barone's Heat & Air, LLC. Professional installers, custom designed systems and full warranties provide peace of mind and unmatched value for radiant heating in Carthage, Missouri. Barone's Heat & Air, LLC serves the Carthage region, providing top-notch service and expertise. Call (417) 232-0017 today to talk about your new radiant heating system.